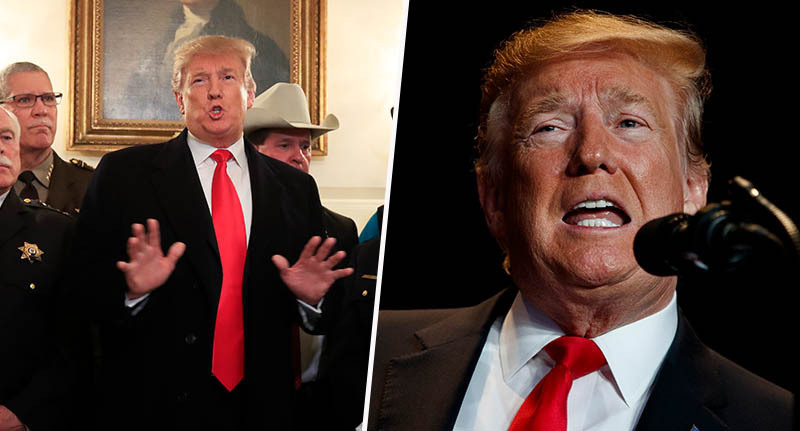 President Donald Trump is refusing to go through Congress to get his border wall built, instead choosing to invoke some Presidential powers to skirt around the democratic process. He is set to declare a rare national emergency in order to secure funding for his planned border wall with Mexico, the White House said. The controversial move would enable Mr Trump to bypass Congress which has refused to approve the money needed. Senior Democrats have accused the president of a ‘gross abuse of power’ and a ‘lawless act’. Moreover, several Republican senators have voiced concern, including Utah’s Mitt Romney, Florida senator Marco Rubio, and the senator from Maine Lisa Murkowski, who said the move was ‘of dubious constitutionality’. In short, declaring a national emergency would free Trump from many of the legal constraints on executive power and give him access to billions of dollars for his border wall project. This comes after a record-breaking 35-day-long government shutdown which the President finally agreed to put a stop to in January. On Thursday February 14, by agreeing to sign a spending bill which does not include finance for the wall, it is hoped another shutdown will be avoided. He is set to sign the bill today (Friday February 15) and White House officials said the president would sign the emergencies act at the same time. Speaker of the House Nancy Pelosi and Senate Democratic leader Chuck Schumer issued a strongly worded joint statement condemning the move. Declaring a national emergency would be a lawless act, a gross abuse of the power of the presidency and a desperate attempt to distract from the fact that President Trump broke his core promise to have Mexico pay for his wall. He couldn’t convince Mexico, the American people or their elected representatives to pay for his ineffective and expensive wall, so now he’s trying an end-run around Congress in a desperate attempt to put taxpayers on the hook for it. The National Emergencies Act contains a clause that allows Congress to terminate the emergency status if both houses vote for it – and the president does not veto (which, in case it isn’t confusing enough, can be overturned by a ‘supermajority’ in both houses of Congress). With a comfortable majority in the House, Democrats could pass such a resolution to the Senate, which is controlled by Republicans – some of whom disagree with their President. White House Press Secretary Sarah Sanders said the president is ‘once again delivering on his promise to build the wall, protect the border, and secure our great country’. She said Mr Trump would ‘take other executive action – including a national emergency – to ensure we stop the national security and humanitarian crisis at the border’.